Almost all martial artists include sparring in their training. However, there are many different types of sparring and there is some debate as to what types are most realistic. Indeed, some question if sparring has any relevance to self-protection situations. To my mind, the amount of relevance that sparring has to the street is determined by how that sparring is structured. In the majority of karate dojos sparring is based on the rules of modern competition. If your aim is to win tournaments, then obviously you need to base your sparring on the nature of competition. There is nothing wrong with competitive sparring in itself; the problem occurs when people believe that such sparring will also prepare them for the street. It doesn't. There are many reasons why competitive sparring, and indeed other types of sparring, are not relevant to the street. We'll cover these reasons as we progress through this series of articles. In addition to sparring based on modern competition, an ever growing number of groups are embracing kata-based-sparring. The kata, when correctly understood, are all about close-range civilian combat. In the past I've written at length about the need to gain live experience of applying the methods of the kata. I coined the term “kata-based-sparring” for this type of training and I'm pleased to say that such sparring is growing in popularity. When correctly structured, kata-based-sparring is very relevant to real situations. However, in this series of articles we will not be discussing how to make sense of kata or how to practise applying their lessons in a live and non-compliant way. Although everything we will be discussing in these articles has relevance to kata-based-sparring, the inclusion of a through discussion on kata-based-sparring, and how kata relates to real situations, would greatly broaden the scope of this discussion. 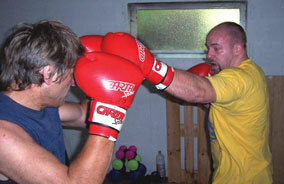 We will therefore focus specifically on how to structure sparring so that it has genuine relevance to real situations. From the onset it is vital that you understand that fighting is what happens when self-protection has gone bad (Photo 1). If you are truly serious about keeping yourself safe on the streets, it's not fighting you should be focusing on, but awareness and avoidance. The way I break down self-protection for my students is as follows: 95 percent of self-protection is awareness and avoidance skills coupled with a healthy attitude to personal safety. If you are unable to avoid a situation, you need to be able to control the dialogue and distance, strike pre-emptively, and use the opportunity to escape. This ability to control a situation before it becomes a fight makes up 4 percent of self-protection. The remaining 1 percent is the fighting skills that you fall back on when all else fails. In my experience, it is common for martial artists to overly fixate on fighting (the last 1 percent) and hence they are not effectively addressing the issue of self-protection. The point I'm making here is that you can be one hell of a fighter and yet still be incapable of keeping yourself safe. If your awareness skills are poor, you'll be taken out before you are even aware there is a threat. You simply won't get the opportunity to use your fighting skills. Consider that no matter how good a fighter you are, there will be people who are better. The way to keep yourself safe from more skilled fighters is very simple: don't fight them! Avoid the situation entirely, and if you can't, control distance through talking with your hands (keep them between your assailant and yourself), use dialogue and deception to facilitate a first strike and use the moment of confusion to flee. In this way it can be possible to protect yourself from people you may not be able to out fight. However, if all that fails then you have no option but to fight. In this series of articles we are looking at training for that last 1 percent should all your other skills fail; it is therefore not appropriate to discuss in detail awareness and pre-emption. The reason I have mentioned them is that it is vitally important that the sparring methods we are going to examine are viewed from the correct perspective. Remember, fighting skills aren't the key to self-protection: fighting is what happens when self-protection goes bad. Having established where sparring and fighting fit into the grand scheme of things, the next thing we need to briefly cover is the nature of the environment we are training for. In these articles we are talking about the street and therefore the nature of the street will determine how we should spar to prepare for it. If we look at the sparring used in the various combat sports, it is immediately apparent that many differing methods of sparring exist. The types of sparring vary because what is needed to win varies. What is needed to win is determined by the rules, and hence people sometimes assume that because as there are no rules in the street, getting rid of the rules will make sparring like a street situation. However, it's not that straight forward. Aside from the lack of rules, there are many other things that make a street situation what it is. To make our sparring relevant to real situations, we need to ensure our sparring considers all the things listed above. When they are factored in, sparring can be quite a bit different from what is seen in most dojos. This does not mean other types of sparring have no value: far from it! As a martial artist, it's very likely that you will train for a variety of reasons and have an interest in many aspects of martial training. It is therefore entirely possible that you'll spar in more that one way: different types of sparring for different aspects of your training. You may spar in one way for a straight fight with other martial artists, and another way for the street. Some argue that by sparring in more than one way you may inadvertently use the wrong method at the wrong time. I can follow this logic. However, it's my view that the dojo and street environments are so radically different that it is unlikely you'll mix up the various methods so long as you keep the various types of sparring totally separate and are 100% clear on what you are training for at any given time. Having covered some of the key issues, it's now time to look at the first way to make your sparring relevant to the street. Important Note: All sparring is potentially dangerous and must always be closely supervised by a suitably qualified and experienced person. If you don't have such supervision, don't try out the methods we're going to discuss! No matter how realistic sparring is, it is never real. We are always making compromises in the name of safety. If we didn't, every training session would result in the majority of students going to the hospital! We need to introduce necessary flaws into training in order to ensure we can train safely. Without these flaws, training would be just as dangerous as the street; which kind of defeats the whole point of training. It won't make our lives any safer; it will just expose us to many more life-threatening encounters! If you do any of the following you've introduced a flaw into your sparring: train on mats, wear sparring gloves, wear body armour, use a gum shield, limit contact levels, omit techniques such as biting, eye gouges and groin attacks, allow you or your partner to end the fight by tapping out or submitting, etc. Changes such as these will make training safer and more productive, but they also move it further away from a real fight. The trick to ensuring this drift from reality is minimized is to be acutely aware of the flaws and their effects. By being aware of the flaws introduced by any safety considerations, you ensure that the reality of the street stays at the forefront of your mind. Sparring is a means to an end; it is not the end in itself. Being aware of the flaws in sparring also helps keep that distinction clear. It's not just safety that introduces flaws. You may also purposefully introduce some limitations to enhance certain skills. 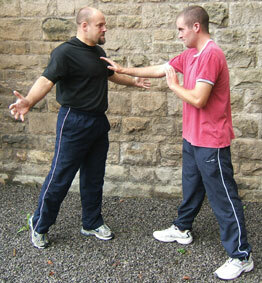 As an example, when sparring you may wish to isolate striking from a clinch. You limit the sparring to striking from a clinch, and therefore throws and takedowns would not be allowed. It's my observation that as soon as you limit what techniques are allowed – which can be a very useful training method – people forget about the methods that have been omitted and hence leave themselves vulnerable to them. So even if you've agreed not to permit throws when working on clinch striking, you should still ensure you don't get into bad habits by being aware of the flaw you've introduced. Competitive and dojo sparring often begins with a formal show of respect. Street fights don't start that way. They are frequently preceded by deceptive or aggressive dialogue. To be adequately prepared for the street, you need to have exposure to such talk so that it does not faze you. Deceptive dialogue occurs when the assailant closes the gap between you by asking for directions, the time, a light for a cigarette, etc. He may appear friendly and unthreatening until its time to become physical. Awareness, controlling distance and trusting your instincts are the key to dealing with this. Aggressive dialogue is when the assailant will scream, shout and swear in an attempt to intimidate you (Photo 3). The aim of this aggressive behaviour is to get themselves pumped up enough to physically attack, and to hopefully overload you with fear so that you freeze and are unable to effectively deal with the situation. If you're not used to such naked aggression, this method will probably work and render all physical skills you have redundant. When sparring for the street, begin the fight with one person (or more) taking on the role of the bad guy. They should close the gap with either aggressive dialogue, or deceptive dialogue (that may switch to aggressive). It's important to make the dialogue and associated body language realistic. Push, shove, splay your arms, shout and swear. Although it's training, as the bad guy you should attempt to intimidate your partner in the same way a real assailant would. The other person should attempt to control distance and talk the situation down. Sometimes the bad guy may decide to back away without the situation getting physical. On other occasions, either party can begin the sparring when they feel it is appropriate (Note: the good guy should always try to pre-empt and not “wait” for the bad guy to start the fight. More on this later in the series). In this first article we've introduced some of the issues surrounding real situations and sparring. We've also covered two of the key ways to ensure your sparring has relevance to the street. In part 2 we'll cover four more keys to making your sparring realistic. Thanks for taking the time to read this article.